JenniferSoft and Caucho Technology started strategic cooperation with a joint marketing activity. 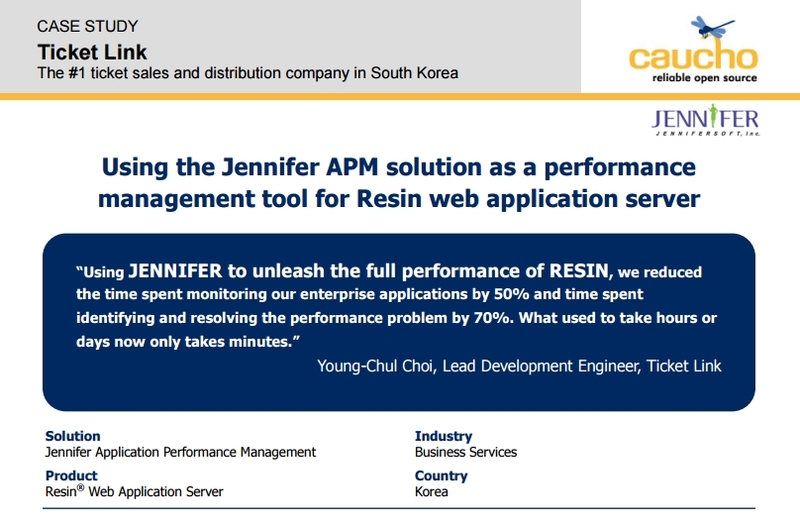 Caucho Technology posted the special case study using the Jennifer APM solution as a performance management tool for Resin web application server on its website main page, in an effort to herald JENNIFER to users who are using Resin. You can get the more substantial data from the case study and it verifies that JENNIFER provides efficient real-time system monitoring, practical performance problem diagnosis and troubleshooting, and effective performance management for Resin WAS. JenniferSoft and Caucho Technology will work together on efforts to promote cooperation and mutual successs. Caucho Technology is an engineering company devoted to reliable open source and high performance Java-PHP solutions. Caucho is a Sun Microsystems Java EE licensee whose industry leading products include Resin application server, Hessian web services and Quercus Java-PHP solutions. Caucho was founded in 1998 and is based in La Jolla, California.